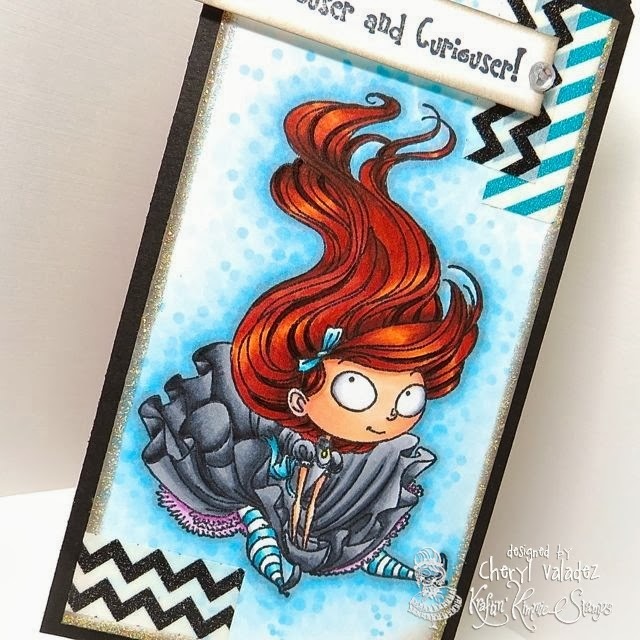 The Ink Trap: A New Challenge at Kraftin' Kimmie Stamps! Bookmarks! 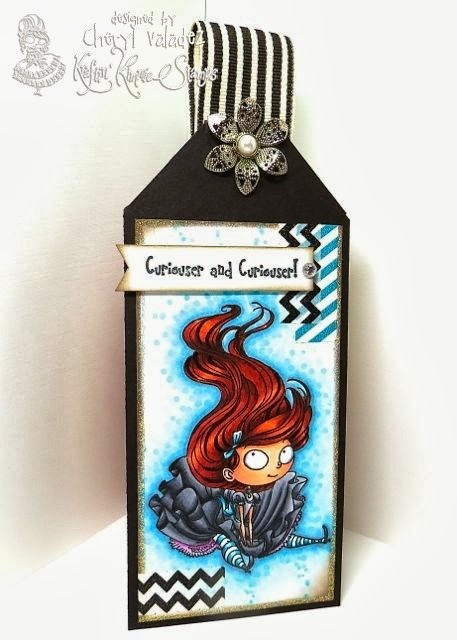 A New Challenge at Kraftin' Kimmie Stamps! Bookmarks! Welcome back! There's a new challenge at Kraftin' Kimmie Stamps starting today and this one will really appeal to all the bibliophiles! This week our hostess is ANGIE!! Her challenge for you this week is School's Back IN!! So she'd like for us to create a BOOKMARK this week (with a Kraftin' Kimmie stamp) and share it! Get creative! You can pretty much use ANY KKS image to create a fun bookmark, but some are especially perfect!! Have some krafty fun and join us this week because we'd LOVE to see your KKS designs. We hope you can play along for your chance to WIN some Kraftin' Kimmie rubbah!!! I've used Alice in Wonderland on my bookmark and I took my first foray into washi tape. I only used a few tiny strips, but I gotta start somewhere, right? Speaking of books, I used to be quite the voracious reader, but now that I've started the downhill descent into my "golden years" I can't seem to stay awake once my head connects with my pillow. This is very disappointing since I did most of my reading in bed, but after the Sandman makes his sudden unexpected visit, I invariably end up hitting myself in the face with my book as it falls from my hands and I drift into sweet sweet slumber. Talk about rude awakenings! Since reading in bed has now become dangerous for me, I have had to find other ways to enjoy a book once in a while. I just recently discovered Audible and though I considered it cheating at first, I now look forward to it. Not since I was a wee child have I known the pleasure of having someone read to me and let me tell you, I'm diggin' it! I just finished "reading" Bossy Pants narrated by the Author herself, Tina Fey. Hilarious! It was if I was having a casual chat with my insanely funny, egocentric friend (after all, she did all the talking). I'm sure if I had read it from "scratch", I would have done a bit of skimming and completely missed the humorous nuances that Tina (yes, we're on a first name basis) added to it. I'm at the tale end of my second book on Audible, Sacre Bleu by Christopher Moore. It's considerably longer than Bossy Pants, but the narrator is really good! I listened to it last night as I was coloring Alice in Wonderland for this bookmark and guess what happened? I feel asleep! Yep, you read that correctly. I dozed off right at my art desk! Thankfully I can rewind the book by a few minutes, but sheesh! I really hope this doesn't become an issue. Be sure to check out this week's Frugal Friday Specials which are up until Sunday night with a selection of our favourite stamps on 25-50% OFF!! Not to mention we've got some brand new 6x6 Paper Pads! OH and our FREE GIFT WITH PURCHASE is coming to a close on Sunday night as well!! Love this adorable image of Annie's! Makes a great bookmark!! Love your bookmark, I haven't been taken with the washi tape craze either but I like how you used it here. I love my audible (I know, you know that) and if you are looking for another author to listen to, try Jen Lancaster. She is the Queen of Sarcasm, absolutely hysterical!